The JAERO decoder for AERO signals on Inmarsat satellites has recently been updated to version 1.03. This new version supports the decoding of 10.5k Aero-H and Aero-H+ signals. The author of JAERO Jonti writes that on these channels he’s seeing significantly more traffic than on the narrowband signals and that he was suprised to see that other non-aircraft messages such news was broadcast on this 10.5k signal. Jonti writes about his experience in developing the 10.5k decoder and his experience with receiving the messages in this post. AERO is a system similar to VHF ACARS, but instead of running over terrestrial VHF it uses an L-band Inmarsat satellite link. 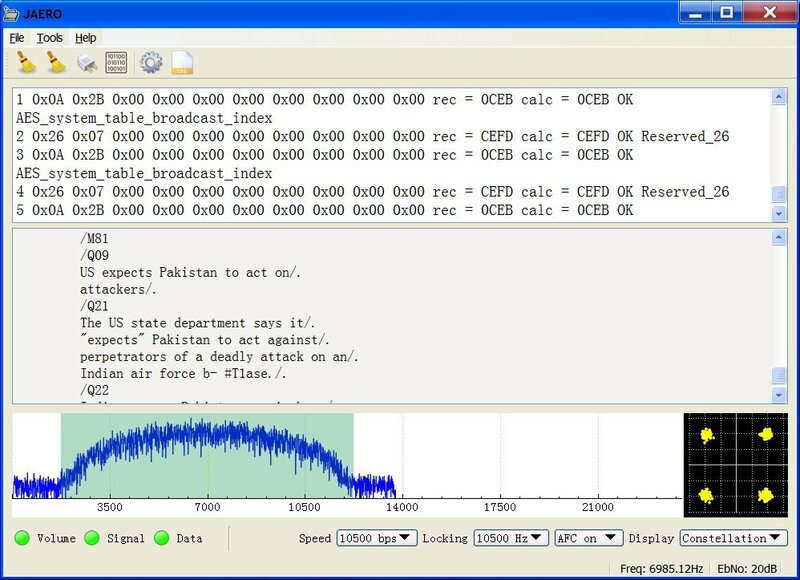 Our first post about the JAERO decoder explains a bit about AERO, and this previous tutorial about decoding Inmarsat EGC messages may help you get set up with decoding Inmarsat signals in general. Jonti discovered that news updates are also broadcast on 10.5k AERO. 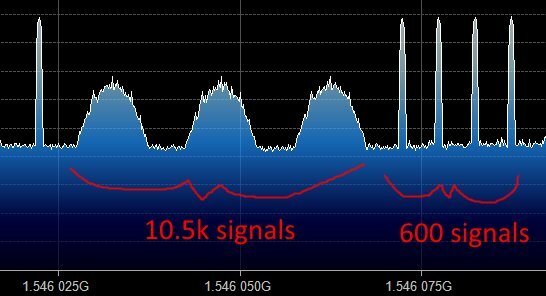 What the 10.5k signals look like compared to the 600 signals. If you like Jonti’s apps, then please remember to donate a small amount to him so that he can continue to work on them more. His PayPal donate button can be at the bottom of his main page. I know that for the 600 bps signal, the bandwidth is 800 Hz, what about the 10.5 bps, and the signals showing in the screenshot, what bandwith setting is that at? Also is it normmal to find these 10.5k signals on 1545 MHz? They seem wider in my SDR# than the narrower 800 Hz ones. Have you wrote an article that Jonti wrote comparing the old RTL-SDR, your blog’s RTL-SDR, and the SDRPlay, and their performances at L-Band frequencies? It’s quite fascinating, especially with the spectrum lab graphs he has for all 3 SDR units, of which your blog’s unit did better in stability. However, Jonti noted that sensitive at L-Band is best achieved with SDRPlay with active antenna. He also tested using passive antenna. It has too much java overhead, I can’t get it to run for more than a few seconds, especially when I run SDR# at same time, which must be done. The 1st version ran OK. Guess I need a high power quad 4 or i5 PC, but that’s not fair. If you like and enjoy JAERO please donate as a small sign of appreciation of Jonti’s efforts. See PAYPAL Donate button at the bottom of his page in the above link. Good idea, I just donated.